එහෙනම් දැන් වැඩේ පටන් ගමු. මේකෙදි ඕන වෙනවා Text Editor එකක්, web Browser එකක්, Jquery Library එක. 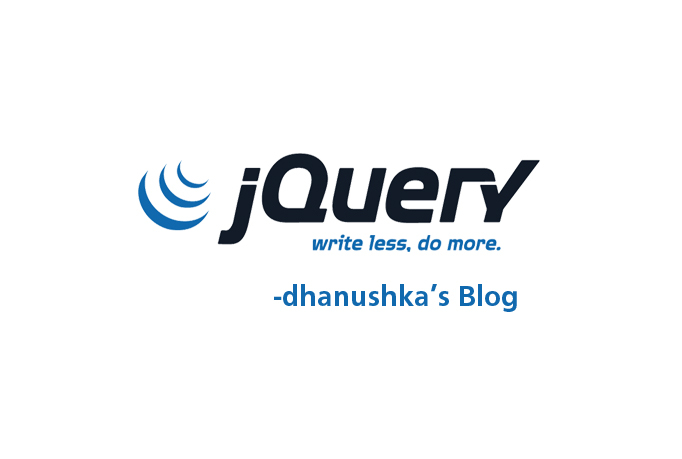 Jquery Library එක මෙතනින් ගන්න පුලුවන්. එහෙම නැත්තන් CDN එක use කරන්නත් පුළුවන්. CDN ගැන දැනගන්න මේ පොස්ට් එක බලන්න. මේ තියෙන්නේ CDN එක. සාමාන්‍ය library එකක් විදියටම code එකකට add කරගන්න පුළුවන්. Head tag එකේ දාගන්න. එහෙම නැත්තන් CDN use කරන්න පුළුවන්. මේ ලියලා තියෙන්නේ එහෙම selector use කරන විදිය. ඒ වගේම මේකේ div, label කියන ඒවත් selector විදියට use කරන්න පුළුවන්.දැන් බලමු Jquery Syntax use කරන්නේ කොහොමද කියලා. Jquery syntax වල තියෙන්නේ මේ Structure එක. selector කියන තැනට එන්න ඕන id, class, tag එක. මේක ලියන්නේ id එකක් නම් “#mydiv”, class එකක් නම් “.mylabel”, tag එකක් නම් “div”, ඒ වගේම this කියන ඒකත් use කරනවා. this කියන එකෙන් select කරගන්නේ current element එක. selectors ගැන විස්තර කරන්නම් පස්සේ. action කියන තැනට එන්නේ Jquery වල දීලා තියන functions. show, hide, toggle වගේ ඒවා තියනවා. ඒවා ඉස්සරහට බලමු. අපි ලියන හැම Jquery code එකම ලියන්නේ මේ document ready event එක ඇතුලේ. මේකට හේතුව වෙන්නේ document එක, එහෙම නැත්නම් html page එක fully load වෙන්න කලින් Jquery code run වෙන එක නවත්තන එක. එහෙම නැවතුනේ නැති උනොත් elements වලට load උනාට පස්සේ කරන changes auto apply වෙනවා. ඒ කියන්නේ image එකක් resize කරලා තියනවා නම් add වෙන්නේ resize කරපු image එක. මේ වගේ අඩුපාඩු හදාගන්න පුළුවන් මේ ready event එකේ code කරනවා නම්. දැන් බලමු selectors ගැන.මේකේ කොටස් 3ක් තියනවා. tag එකක් විදියට හඳුන්වන්නේ div, button, input වගේ ඒවා. මේවා selector එකක් විදියට use කරන්න පුළුවන්.මේ තියෙන්නේ HTML code එක. මේ jquery code එක. $(“p”) element එක select කරගන්නේ මේකෙන්. මේකෙන් කියන්නේ element එකට දෙන id ඒක selector එක විදියට ගන්න එක.මේ තියෙන්නේ HTML code එක. මේ jquery code එක. $(“#para”) element එක select කරගන්නේ මේකෙන්. tag එකක් විදියට හඳුන්වන්නේ class attribute එකේ දෙන name එක.මේවත් selector එකක් විදියට use කරනවා.මේ තියෙන්නේ HTML code එක. මේ jquery code එක. $(“.para”) element එක select කරගන්නේ මේකෙන්. පොදුවේ වැඩිපුර භාවිත වෙන selectors පහලින් තියෙන්නේ. select කරගන්නේ මොකද්ද කියලා comment එකේ තියනවා. මීළඟ පොස්ට් එකේ events විස්තර කරන්නම්. පැහැදිලි නැති දෙයක් තියනවා නම් Comment කරලා අහන්න. ලිපිය ගැන අදහසක් දුන්නොත් තව හොඳට tutorial එක කරන්න පුළුවන්. Great work. hope to keep in touch with these posts. You’ve tagged Jquery Library with this post, Is that just to see? CDN, that i have attached first is woking, other links are just for explain how to add library.